We have all had that moment: You’re headed out to a party and suddenly it dawns on you that you’ve completely forgotten to bring any kind of dish to share. Now, it’s always ok to show up with a bottle of wine to share as well, but sometimes you just need a last-minute party snack. So what do you do? 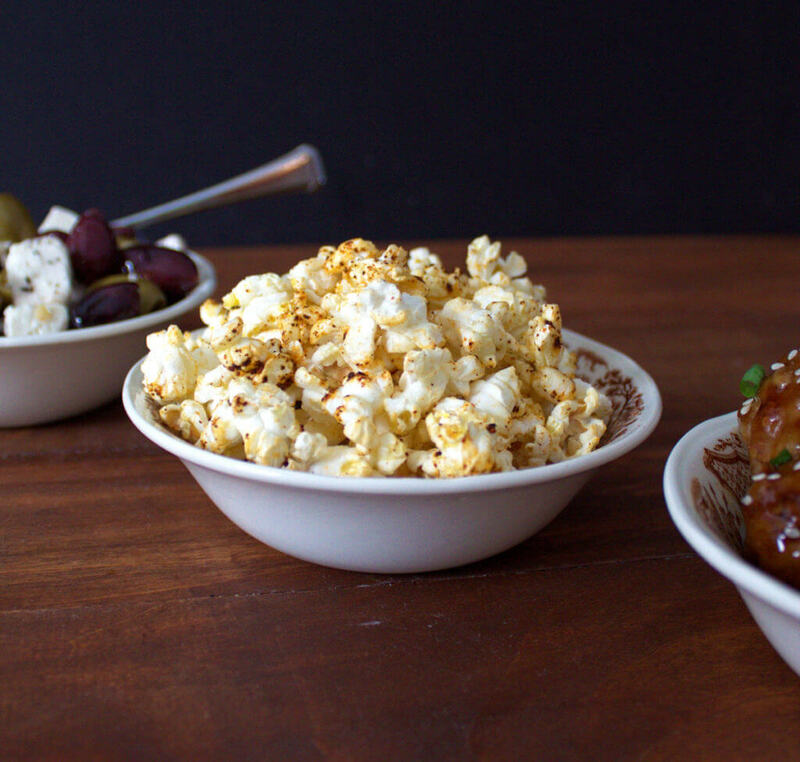 You pull out this list of quick and easy snacks to bring to a party. We promise that these will save you every time. Each recipe takes 10 minutes or less to complete and will be sure to please hosts and guests alike. We have even included a few travel tips and last-minute shortcuts. First and foremost, don’t overlook the basics. A quick stop at the grocery store for some hummus and pretzels, veggies and dip, or chips are always great options, too. Plenty of hosts understand that life gets hectic and these are the kinds of old standbys that everyone loves. However, if you are looking for something that takes just a little extra effort, we still have you covered. One of the easiest and most convenient of the last-minute party snacks is a fancy flavored popcorn. Since popcorn is nonperishable it’s easy to keep on hand. All you need to do is pop it up in the microwave or air popper, then toss it with some oil and a few of your favorite spices. Bring along a jug of iced tea (we recommend the Happy Hour hibiscus-lime herbal tea) and you’re good to go. In a small bowl, combine the oil, salt, and spices. Place the popcorn in a large bowl and drizzle with the oil mixture. Toss well and serve. 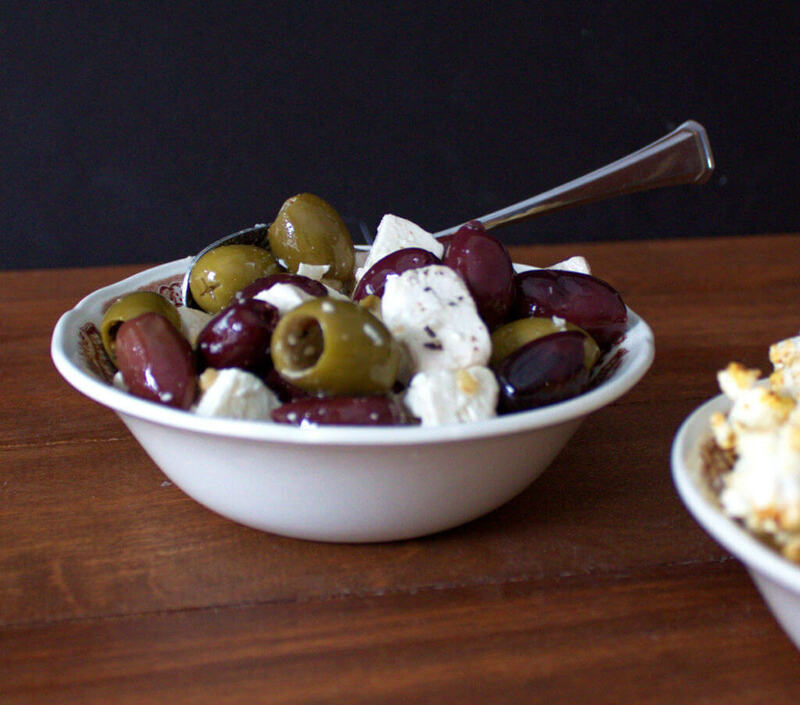 Another very easy and always appreciated snack is marinated olives and cheese. Marinated olives make a great accompaniment to any cheese board as well. Start with an assortment of olives and a good marinating cheese, such as mozzarella pearls or feta, and then again just toss it with some of your favorite oils and spices. Make it extra fancy by adding some roasted red peppers or pickled onions. If you are really in a pinch you can opt to toss the olives and cheese in your favorite oil-based dressing such as Greek or Italian. This snack also makes a great hostess gift when packaged in a jar and wrapped in a bow. For traveling with this dish, just be sure you have it in a well-sealed container as oil is one of those things that can easily seep out. We have found a ziplock bag works perfectly. Simply bring a serving bowl with you and dump the contents of your bag out when you arrive. Pair this one with our Noble Blend green tea. The sweet, grassy notes of green tea with strawberries and goji berries helps cut through and complement the savoriness of the dish. Combine all ingredients in a large ziplock bag. Toss well to coat. Let stand for 1 hour or overnight. Serve room temperature or chilled. 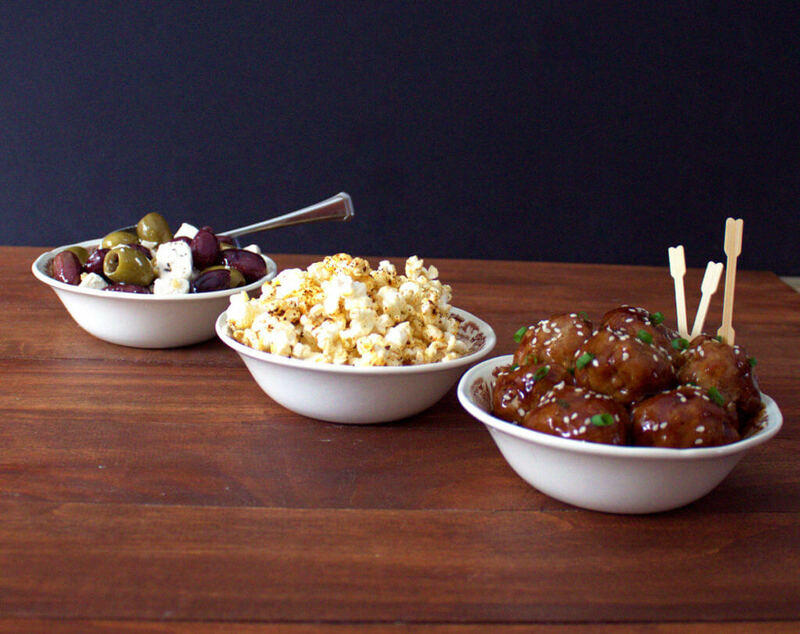 Our last easy snack to bring to a party is these honey soy meatballs. These are the perfect last-minute party snack because they give the illusion of being very involved. A handful of ingredients are whisked together to make the sauce, which is heated and poured over pre-made meatballs. Now, it’s probably not likely that you keep pre-made meatballs on hand, but a quick trip to the grocery store on the way to the party takes care of that problem. Just mix up the sauce in a crockpot before you leave and dump the meatballs in when you arrive. If they are frozen, start the crockpot on high until they have defrosted, and in a few minutes they will be ready to serve. We recommend the fruity peach and bourbon vanilla notes of our Passion Blend oolong tea with these meatballs. The hint of natural sweetness pairs well with the honey and is the perfect foil to the salty soy sauce. In a large crockpot, combine the garlic powder, honey, soy sauce, and ketchup and mix until well combined. Add meatballs and toss to coat. Heat the crockpot on high for 30 minutes to 1 hour, then reduce to low and serve. Keep on low to remain warm. If your crock doesn’t have latches to keep the lid and bowl in the heating unit during transport, we have had great success with wrapping rubber bands around the handles and across the top. Then, if the crock gets jostled, its contents will still be safe inside. Another option is to keep all the ingredients in a sealed container and dump them into the crock on arrival. 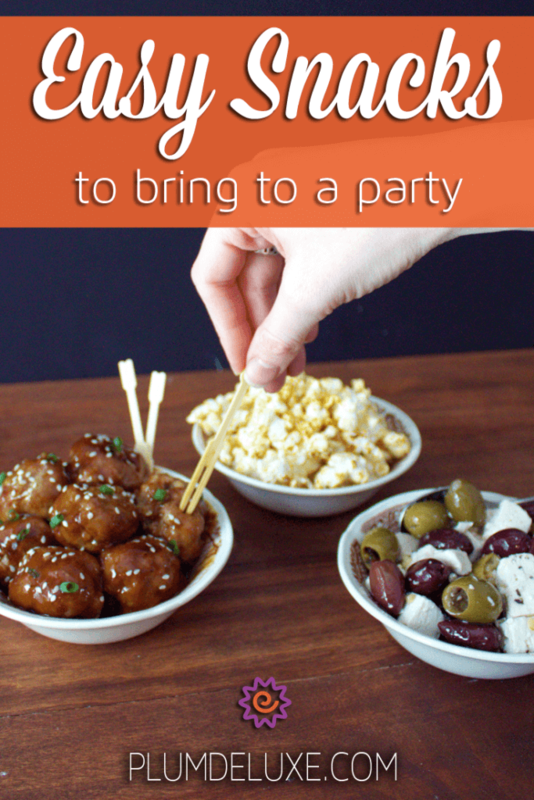 These three recipes are our favorite easy snack to bring to a party; they are quick to put together, with lots of variations for every occasion and always crowd pleasers. If you have a little more time we also have an array of slightly more involved bite-size snacks, such as our Spinach Artichoke Bites or Guacamole Shrimp Cups. We have you covered for every situation, so you can relax and enjoy the party.